Lots of papers show that companies substituted dividends for repurchases around the 2003 tax cuts. Surely the expiration of the 2003 tax cuts will have the opposite effect; companies will substitute repurchases for dividends. I wish the term dividend yield would die. It is completely irrelevant. It ought to be replaced by the payout yield, which is much more economically meaningful (http://www.jstor.org/stable/10.2307/4622289). This arbitrary tradition in which dividends are sticky and repurchases are not is silly. I agree with you on the generic point that we should talk about cash returned (dividends + buybacks) when we talk about dividend policy. In the context of taxes, though, we have to separate the two and I am afraid that the facts don't bear you out when it comes the 2003 plan. The rise in the number of companies paying dividends and in total dividends paid out was surprisingly small. Isn't it just a matter of time before companies use the tax efficiency of payout (i.e. utilization of share repurchases) as a competitive advantage to increase demand for their stock, and hence lower cost of equity? Aren't any of these companies bold enough to break the tradition of inefficient dividends and replace them with (equally "sticky" if that's their intent) repurchases? Interesting. In Australia the top personal marginal tax rate is 48% and kicks on at around $180k. None of this filing jointly stuff meaning opportunities to income split are limited (unless you can divert profit share from a business via a discretionary trust to your spouse and other family members). We have concessional tax on capital gains and imputation on dividends. The dividends are franked to the extent the company has paid tax and the recipient receives a franking credit equal to the company tax paid. So corporate tax is a pre-payment of personal tax. However foreign companies can only use franking credits to offset dividend withholding tax so not sure of the impact of this for marginal investor. Not sure if an S Corp in the USA achieves a similar outcome ie income passed through to owner. Are foreign stock dividends treated the same as domestic for US tax purposes? Or could we perhaps see increased flow to international equities that pay relatively higher dividends? "I wish companies were more responsive and flexible when it comes to dividend policy…"
Obviously, you live off of your salary rather than dividends. Retirees often depend on their dividends to pay their bills each year and don't want to invest in companies that suddenly cut them off. It's the younger people who aren't going spend their money for another 30 years that focus on capital gains. At least that's what my grandfather told me back in 1976. Of course, he probably never heard of the efficient market hypothesis. He thought that market sentiment could be very pessimistic for years at a time and depress stock prices more than the companies' ability to produce income. Looking at market valuation metrics in 1999 compared to 1982 and 1947, I think he might have a point. In your post you detail how taxes affect the returns on the risk asset; isn't it also true that they affect the returns on the risk-free asset? And, therefore, the necessary returns from the risk asset do not increase quite so much? My understanding of this is imperfect, so my apologies if this is a silly point. I have no way of knowing how much, so this may be a moot point but would it matter that a portion of the idividuals that hold these divedend paying stock hold them in IRAs or other such vehicles effect your thoughts? If you want to live off your dividends, you should buy bonds or preferred stock. There are plenty of income producing options out there. Equity is always a claim on whatever is left over after your other claims have been met. If earnings are unpredictable, you cannot afford to pay dividends and survive as a healthy company. In your grandfather's day, there were regulated monopolies (phone companies, power companies) that could afford to pay high dividends but those days are gone. Dividends received by US taxpayers on any stock - foreign or domestic - will be affected by the new tax law. So, buying high dividend paying foreign stocks is not going to get you off the hook. You can create your own homemade "dividend" by clicking the "sell" button on your brokerage account. Instantly, you will have cash. There is no difference between this method and an actual cash dividend distribution aside from a nominal trading commission and bid ask spread. If your trade is large enough, the commission becomes arbitrarily small. Can you comment on which other factors that may drown out the tax effect you have in mind specifically when you wrote that last paragraph? Thanks! I think you may be overly pessimistic, mostly for the reasons you outlined yourself in point 2. Not all investors pay taxes on investment income. Also the lack of suitable income generating alternatives may force many to 'grin and bear it' (even more than they are now). One thing that would make me more concerned however is if there was a substantial spread trade into dividend paying equities i.e. low cost credit / leverage used to buy such securities. But I don't know if that is the case or not. I did not see an answer on the IRA/401K/403B/etc ownership vs taxable accounts. In my own case, over 90% of my dividend payments are in IRAs. Given the high ownership of mutual funds, index funds, etc in tax advantaged accounts, don't you believe the affect might be lower than your examples above? What about this? Rational people knew that the tax rates brought in by Bush (while he was increasing spending faster than Carter, Reagan or Clinton ever did) wouldn't last forever. In fact, it's surprising they lasted this long. So they didn't mechanistically bid up stock prices in 2003 and 2004 when the change went into effect (and I doubt anyone can tell with precision what caused price changes in either direction at that time), except to pay a modestly higher price to reflect a few years of the tax savings. And now the reverse can happen. But to a small extent. Investors weren't suckered by the Bush tax cuts. Its an eye opening article but theres a silly question. How does the higher ERP translate to lower stock value? I see your point that the required return on the s&p example will increase to 8.26% on a pre tax basis but don't get how it will translate to lower s&p value. Appreciate your explanation. Thanks. Keep in mind that for fortune 100 companies, their majority shareholders..pension, endowments and mutual funds, don't pay tax, as neither do IRAs. A higher ERP causes lower stock prices the same way that higher interest rates cause lower bond prices.. a higher required return means that you pay less today for the same investment. Following out the dividend cliff thinking further, do you think that in contrast to high dividend paying equities, that REITs will become more attractive relatively speaking following the changes in tax law? Regardless if the effect creates and instantly visible drop, or it is already 'baked-in' to some degree, values have and will be affected non the less. Your analysis may have implications on smaller business valuations as well, regarding the tax affecting of PTEs. Please read my post (which references your post) titled Are We Tax Affecting The Wrong Earnings at wbvb.blogspot.com. Your comments (pro OR con) would be much appreciated! 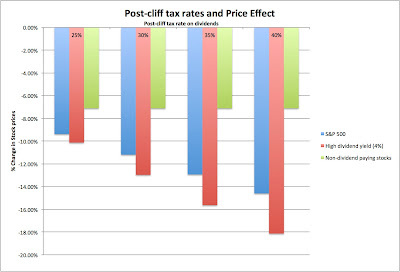 Are you familiar with Clemens Sialm's 2009 AER paper entitled "Tax Changes and Asset Pricing"? It's of my favorites. Why do you hold dividend yield at a constant 2% in your analysis? As stock prices fall, dividend which are usually set at a dollar amount and are "sticky" will remain the same. 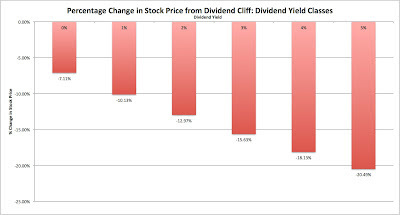 Because of this, dividend yield will increase as stock prices fall. I am under the impression that this increased yield will cushion the fall in stock prices somewhat. Would this lead to smaller correction in the overall market? The article is really very excellent. Really this information will become more useful for the people, especially those who are in business field. Tax paying and valuation is the most important things for us. Of course, it does not seem easy to compute which % the company will get back on its taxes, but it should imply that, in case of an increase in a tax rate for all companies, the fall in share prices should be lower than the value of the discounted taxes. Would this reasoning make sense? Depreciation is an accounting process in which the assets, belongings and buildings are depreciated with the passage of time. Depreciation is a very important procedure that must be done after regular intervals to find out the current value of the asset at that time. Thank you for discussing the topic - this focus on the dividend tax seems to be gaining alot of traction recently - Having listened to conference calls by the BB banks recently their market strategists seem to be displaying greater focus on the issue than that paid in the press at the moment. As the "search for yield" theme has been extremely successful over the last couple of years relatively - it could be dangerous to ignore the tax cut expiration. I also along with ERIC who posted before me would like to ask you to elborate on the assumption to keep yield constant - as yield is a fuction of price as the price drops the yield will surely increase and you do not include the impact in your analysis. I am not sure whether this will have a big impact but I also believe that this would cussion the fall or the sell off in the market to reach the same risk premium we currently recieve. his is really great stuff and Delicious topic that attract some one. It would be a ver very bad idea to have the tax on dividends increase from 15% to 35% or 40%. Its a real killer for those investing in dividend stocks. Aswarth, an intersting topic. Thanks. As an overseaso observer could you suggest what you beleive will be (if any) the impact of a dividend tax policy change on the relationship between equities and corporate bonds. Of late we have saeen a significant pickup in interest surrounding (historically cheap) debt-funded shareholder-friendly initiatives; debt being used to fund to special dividends to shareholders. 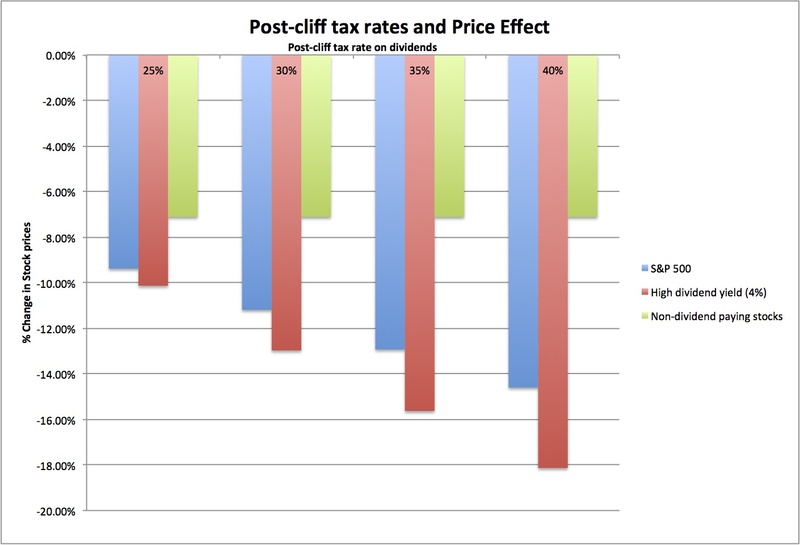 What do you think the trend will be once we have looked - or stepped - over the fiscal cliff in January? To verbalize the genuineness this is a polite post concerning this topic. I got an untainted solution from here. Also I can refer to you all bestcustomessay.org/essay-writing here to get educational helps. All the same will wait for more posts from the blogger. Thanks a lot……. I agree with you, Aswath. These new implications will put a great impact on the business of dividend stocks. The companies have to modify their existing dividend policies to comply with the new tax rules. Its totally a unique dress designs really very impressive. I will bookmark this for future reference and refer it to my friends. Thanks. We believe in sharing obviously. In fact, the 2003 law did not to lead to a surge in dividends (though a few companies pay special dividends in the immediate aftermath) and I don't think that a reversal of the law will lead to a sudden reassessment of dividend policy. Awesome stuff.Thanks for sharing.I would like to bookmark this page. Further information so far there was specified is simply optimal, nevertheless were striving each of our level better to help to make very best initiatives to present just what the surfers need to have. You do want to know more. That is really very good blog, I am glad to know. Thanks for sharing ! I am the daily visitor of your blog and I really like to read this posting. Please share some more posts like that. Thanks. Way to many goddam links on this page. Does anyone know how to how to tighten skin? Nice blog! I have to reading this blog. Some of you may have known about Charlie Munger, Warren Buffett's lesser known financing accomplice Electrical Contractor in Surprise AZ at Berkshire Hathaway. I'm glad I was able to find this blog as it contains information I couldn't find elsewhere. Thanks a lot for your efforts to put this website together.